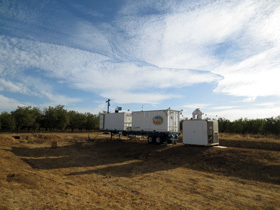 Members of the Atmospheric Lidar Research Group can usually be found working in either of these places: PHSC lab - room 128 (left photo), or the Lidar Field Site (right photo) at the University Farm. 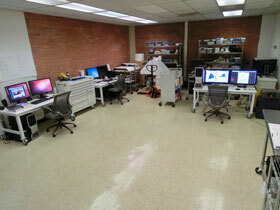 The lab in PHSC is equipped with high end workstations for students and staff. PHSC 128 provides areas and tools for maintaining lidar system components. Most of the post-field phase data processing is performed on supermicro servers (with GPUs and RAIDs) in the Butte Hall co-location area. We use IDL, Python, and CUDA as computer programming languages to write custom software to process the lidar data.